Here are some pix of my home theater set up in the great room of my log home. You all know how good it sounds, so I won't try to come up with new words for it. You have a very beautiful home, and the Axiom / Panasonic setup fit in very nicely. Enjoy! Thanks for the nice pictures. 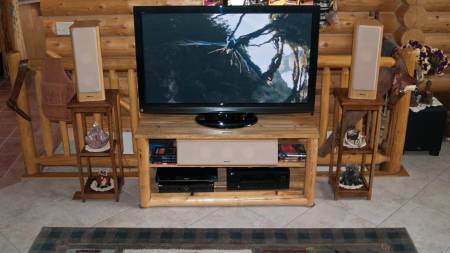 That is a great looking setup, whippersnapper! This is so cool. One of the best I have seen. M80's would look good there. Careful, Whip. This is how it starts. Congrats! So simple and clean. Nice, nice. Nice! What sub are using?